Stone farmhouse with large equipped garden from which you can admire a wonderful view of the Tuscan Maremma. The house is an isolated house and is located on the hill above the medieval village of Roccatederighi overlooking the Grosseto plain. Lying in the garden beds, the medieval village divides the Maremma plain into two parts. On one side you can admire the sea with the Gulf of Follonica and beyond the Island of Elba and Corsica, on the other side the city of Grosseto and the island of Giglio. You can take long walks immersed in nature and in the silence of the wood, but also go into the alleys rich in history of the medieval fortress. In Roccatederighi you will find all the restaurant / pizzeria services, bars, grocery stores, pharmacy, carabinieri, etc. The house is equipped with all comforts and the garden is equipped with sunbeds, deck chairs, barbecue, table tennis and a large space both shaded and sunny. The house is located in a strategic area to reach cities such as Siena, Florence, Pisa, Rome, etc. and places of historical interest such as San Galgano and Massa Marittima. It is also possible to reach the known seaside resorts (beaches / cliffs) of Castiglione della Pescaia, Follonica, Punta Ala, Cala Violina, Baratti, etc. ps Pets allowed, for periods other than weeks contact the property. 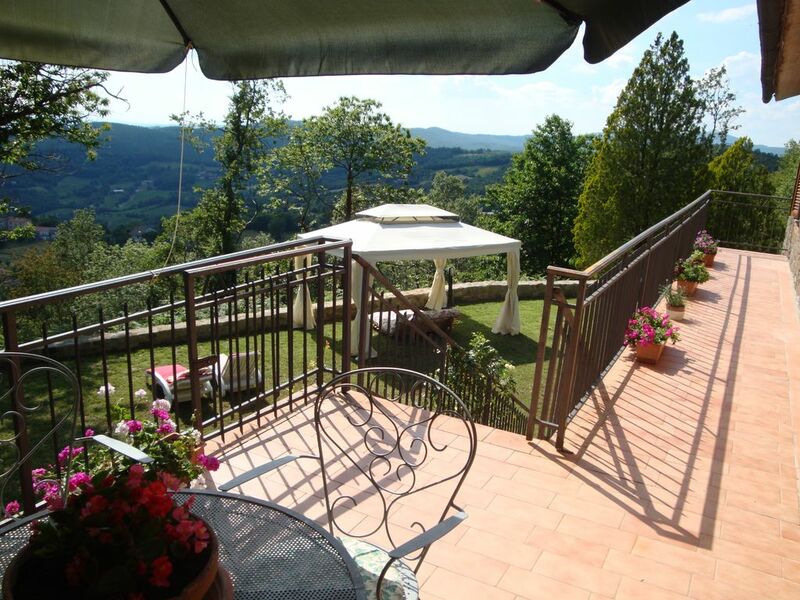 Possibility to eat at La Conchiglia di Roccatederighi restaurant at an agreed price. Pets allowed. Nous avons apprécié aussi bien la chaleur de l'accueil des propriétaires que la beauté incroyable et le calme absolu du jardin. Si la maison est modeste, elle est très confortable, le décor qui l'entoure est somptueux. La vue sur le village de Roccatederighi enchante et les collines s'étendent à l'infini jusqu'à la mer... Merveilleux. Grazie Eléonore per il bel commento. Noi siamo molto felici che i ns ospiti si trovino bene e che portino con se un bel ricordo del soggiorno presso la nostra casa. Ciao a presto.